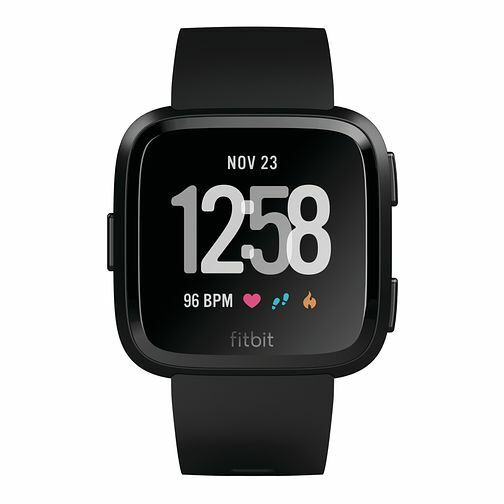 The Fitbit Versa health and fitness smartwatch has been created to help your healthiest possible life and reach all your personal fitness goals. With a number of features such as 24/7 heart rate, apps, phone-free music, coaching and more. A light geometric case and dashboard. Play music to motivate you during your workout with the ability to store 300+ songs, stay on track and get inspired by a global fitness community. get personalised on-screen workouts that play on your wrist, coach you through each move and adapt based on your feedback. Keep fit and stay stylish with this Fitbit Iconic Smartwatch. Keep fit and stay stylish with this Fitbit Versa Smartwatch. Fitbit Versa Black Strap Smart Watch is rated 5.0 out of 5 by 3. Rated 5 out of 5 by Anonymous from Great watch I bought this watch for my son as I also have the Fitbit versa. He has joined the gym and being more health conscious so can connect it to my fitness pal also. It’s easy to use and connect to the Fitbit app. A great design feature is picking a different watch face to suit the mood. Rated 5 out of 5 by Anonymous from Great product great service Product is exactly what you want when you need something to keep a record of your fitness levels and it’s really good looking also!